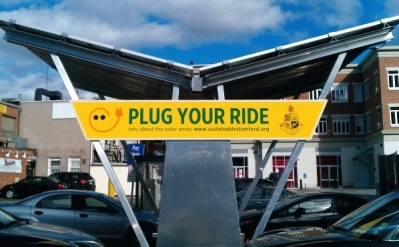 The City of Stamford installed a solar-powered double electric-vehicle charger (one unit capable of charging two cars) at the Bedford Street Garage in September 2012. The 3.76-kilowatt facility is located at 17 Forest St., with another entrance on Bedford St., opposite Landmark Square. For real-time reports on the amount of energy the solar array is producing, click here.